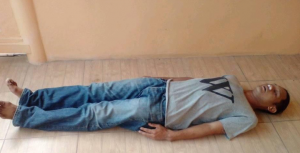 Recently, a man in Singapore was shocked by what he had to witness for a moment. 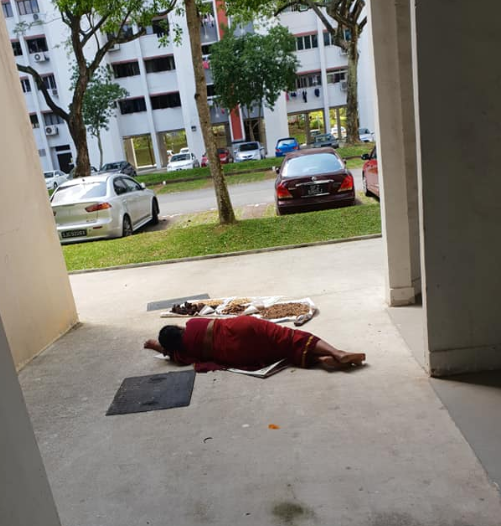 According to mothership, a woman wearing a red saree was spotted lying down on the ground motionless. While this scene might’ve looked like she had jumped off the apartment building in an attempted suicide, in reality, she was very much alive. In fact, she was just drying her food stuff! “Walao, I thought aunty commit suicide leh until I saw her drying her stuff”. 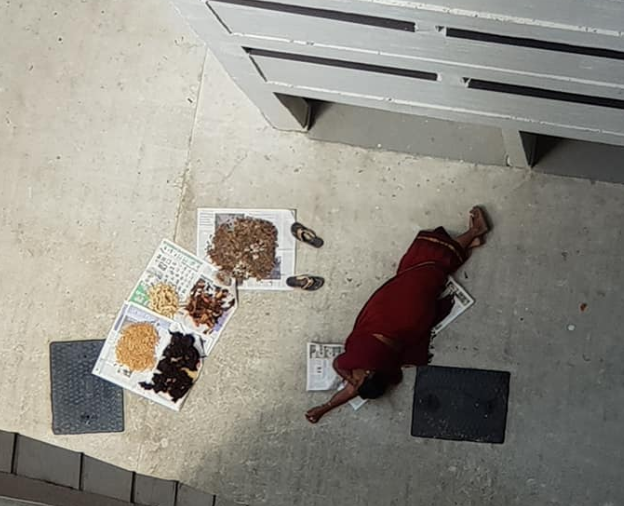 From the above picture that was taken from the top angle, we can see that the woman had most likely gotten too comfortable and had fallen asleep while waiting for her food stuff – which looks like mixed spices – to dry under the sun. She was just taking a nice afternoon nap! If you’re wondering why she had to take her nap right next to the items that she had placed to dry, that’s because by doing so, it would apparently ward off birds from picking up the edible pieces. Just like the function of a scarecrow! That said, the post has since been taken down by the Facebook user. But thanks to the internet, these shots will probably remain on the world wide web forever. What do you think of these photos? Did you get a little scare yourself? We know we did!